Abstract: In heart failure (HF), hyperkalemia is a frequent problem because of several factors, such as neurohormonal mechanisms involved in the disease, renal failure, comorbidities, and drugs with a prognostic benefit. These drugs can block the renin–angiotensin–aldosterone system, and therefore, serum potassium levels can increase, mostly when combined with other drugs as nonsteroidal anti-inflammatories, digitalis, heparin, etc. Hyperkalemia can have severe consequences if not corrected, mostly at the cardiac level (decrease in speed conduction, QRS enlargement, ventricular arrhythmias, and asystole). Therefore, it is important to adequately prescribe these potentially harmful drugs (starting at low doses with close monitoring of renal function and potassium levels), to carefully manage the factors that can interfere with potassium levels, and to early treat hyperkalemia if it develops. There are several investigation lines for the design of new molecules that show a similar efficacy to that of renin–angiotensin–aldosterone system, with a lower risk of hyperkalemia: nonsteroidal mineralocorticoid receptor antagonists like finerenone, which is a more cardioselective drug than traditional mineralocorticoid receptor antagonists, and angiotensin and neprilysin inhibitors such as LCZ696, which have proven to reduce mortality and heart failure hospitalizations. Besides, new drugs are being studied, which are able to reduce levels of serum potassium in a sustained and faster way, like chelating polymers Patiromer and sodium zirconium cyclosilicate. In heart failure (HF), potassium balance is affected by neurohormonal mechanisms involved in the disease, as well as by those drugs used for its treatment.1 In HF, a significant reduction in morbidity and mortality is related to neurohormonal activation inhibition by multiple levels of angiotensin-converting enzyme (ACE) inhibitors, angiotensin II receptor blockers (ARBs), mineralocorticoid receptor antagonists (MRAs), and renin inhibitors.2,3 Nevertheless, these treatments can increase serum potassium levels. Hyperkalemia caused by these agents is not frequent in patients who lack other predisposing factors. However, patients with HF frequently show comorbidities and a certain degree of renal failure, a factor known as an independent death predictor in patients with HF.4 Therefore, the risk of severe hyperkalemia during the treatment is significant.5 In this way, patients who benefit more from the use of renin–angiotensin system blockers are those at higher risk of developing hyperkalemia. The objective of this review is to update the knowledge about hyperkalemia in HF, its incidence and treatment, and the mechanisms through which it is produced, and to review future prevention options and therapeutic approaches. Consequences of hyperkalemia occur due to the situation of partial depolarization that the cell membrane acquires. When this situation is prolonged, the cell membrane excitation decreases. Metabolic acidosis is also produced because hyperkalemia interferes with renal ammoniagenesis and with ammonium reabsorption in the thick portion of the ascendant branch of the loop of Henle, complicating the final elimination of acid. Acidosis can worsen hyperkalemia because of potassium release into the extracellular space. The worst consequences occur when potassium plasma levels exceed 7 mEq/L, when hyperkalemia is chronic, or when low levels increase quickly. Potassium levels must always be monitored after the introduction of drugs that may affect potassium homeostasis, some of which are widely used in HF: NSAIDs, high doses of loop diuretics (if they produce hypovolemia), heparin, co-trimoxazole, calcineurin inhibitors, Tolvaptan, etc.58 Because eplerenone is metabolized by the cytochrome p450 isoenzyme 3A4, concomitant use of drugs with a strong inhibition of such enzymatic system (ketoconazole, fluconazole, erythromycin, verapamil) may increase potassium blood levels, and therefore, the risk of hyperkalemia. Such situation does not occur with spironolactone because it is metabolized by the liver but is not subtracted by CYP3A4. For this reason, it should be considered as the mineralocorticoid antagonist of choice when enzymatic inhibitors in high or prolonged doses are used. Finally, it is essential to train the patients who take potassium-sparing drugs about concomitant pathologies that may alter potassium homeostasis, as diarrhea and vomiting. If these symptoms show up, patients should visit their medical practitioner to monitor potassium levels and even suspend the medication if fluid loss is intense. Hyperkalemia needs to be managed both in the short and long term, and there are plenty of measures and drugs for this purpose (Table 2). In the acute phase, the priority in the quick establishment of hyperkalemia treatment should be marked by the presence of electrocardiographic alterations. Electrocardiogram (EKG) is not a reliable guide to the level of serum K+, and the existence of hyperkalemia without any EKG change is relatively frequent, especially in advanced CKD patients. However, it is logical to suppose that the risk of developing potentially lethal arrhythmias increases as baseline EKG alterations appear, although there are no clinical trials available about this topic (there is only little evidence suggesting that T wave tenting is associated with sudden cardiac death).59 Indeed, several authorities30,36,52 recommend treatment for hyperkalemia when EKG changes are present or when serum potassium levels are >6.0–6.5 mEq/L. In case EKG changes exist, calcium gluconate should be injected immediately. This drug acts antagonizing potassium effects over the myocyte cell membrane immediately, without affecting potassium concentrations in plasma. It is important to have in mind that the half-life of calcium gluconate is 60 minutes, so a new dose should be provided if, after this time, potassium levels are still high.60 Concomitantly, insulin administration should begin (~10 IU of regular insulin diluted with 50 mg pure dextrose to avoid hypoglycemia) because this is the most effective and safe treatment to reduce potassium levels in HF patients. The mechanism of action of insulin is based on the stimulation of the Na+-K+-ATPase pump, and therefore, in the introduction of potassium from the extracellular to the intracellular environment. Administering 10 IU of insulin can decrease the levels of potassium between 0.5 and 1.5 mEq/L, and its effect lasts ~4–6 hours.61,62 Beta-adrenergic antagonists and sodium bicarbonate effectiveness and start time are similar to those of insulin. However, both drugs are considered of second choice in HF hyperkalemia treatment because of their potential side effects, such as tachycardization with beta-adrenergic antagonists and sodium overload with bicarbonate.63,64 When these measures are not effective, dialysis should be used, considering this option the last resource due to its lower speed to reduce potassium levels to normal limits. Numerous studies suggest that hemodialysis is more effective than peritoneal dialysis to eliminate potassium excess. Despite all the measures mentioned earlier, and mainly in those patients with a certain deterioration of their basal renal function, sometimes the prescription of aldosterone antagonists is impeded by a trend toward hyperkalemia. Due to the noticeable prognostic benefit of these drugs, investigation lines over the past years have focused on the design of new molecules with a similar effect, but less interaction with potassium levels, and on obtaining potassium binders that allow aldosterone antagonists to be administered with minimal risk. The results of clinical trial ARTS-HF have been recently communicated in the European Society of Cardiology Congress. This trial compared increasing doses of finerenone with standard doses of eplerenone in patients who were susceptible to develop hyperkalemia (type II diabetics, or nondiabetics with GFR 30–60 mL/min). No significant differences were found in the main objective (30% decrease of NT-proBNP levels), or in safety (same incidence of potassium >5.6 mEq/L with both drugs, 4.3%).69 An improvement was observed in most of the secondary objectives (cardiovascular hospitalization, cardiovascular mortality, and mortality for any other reason; hazard ratio [HR] 0.56; P=0.0229), mainly in subgroups that received higher doses of finerenone (7.5 and 10 mg). For this reason, a new clinical trial has been designed (BAY 94-8862)70 to evaluate the morbimortality as main objective in a similar population (diabetics or patients with stage III CKD) treated with high doses of finerenone. Another new drug with a lower risk of hyperkalemia is LCZ696, the first of the angiotensin and neprilysin inhibitors, a molecule that contains neprilysin inhibitor (sacubitril) and ARB valsartan. Neprilysin is an enzyme that degrades vasoactive peptides, among them natriuretic peptides. When the enzyme is inhibited, natriuretic peptides are accumulated, and an increase in beneficial effects is achieved. Likewise, there is a need for more secure and effective drugs which achieve a faster and sustained reduction of serum potassium levels in hyperkalemia patients. Several studies of new oral drugs have been recently published. These drugs were based on polymers that are capable of chelating potassium into the colon, increasing its excretion, and proving a higher efficacy than resins used up to date, and thus avoiding their side effects without the need of modifying the patients’ basal treatment (including ACE inhibitors, ARBs, and MRAs). Another one of these polymeric agents is sodium zirconium cyclosilicate (ZS-9). Packham et al carried a double-blind, multicenter study (placebo versus ZS-9 at three different doses).75 All patients included had potassium levels between 5 and 6.5 mmol/L, and maintained basal treatment including diuretics (ACE inhibitors/ARBs and MRAs). The authors found a higher decrease of serum potassium level in patients treated with ZS-9 (4.6 mmol/L with ZS-9 versus 5 mmol/L in the placebo group; P<0.01). The proportion of patients with mean potassium levels <5.1 mmol/L were 80% with 5 g, 90% with 10 g, and 94% with 15 g of ZS-9, versus 46% with placebo (P<0.001 for all comparisons versus placebo). These works provide a promising alternative to standard treatment of hyperkalemia because basal treatment with RAAS inhibitors can be maintained.76 However, more studies with larger samples and with patients with more severe hyperkalemia are needed in order to assess long-term effects. In HF, hyperkalemia is a real problem due to patients’ age, comorbidities, and renal failure on the one hand, and to neurohormonal mechanisms involved in HF and to the drugs used for its treatment on the other hand. These drugs have consistently proven the prognostic benefit for HF patients, so the objective should be to minimize the risk of acute renal failure and hyperkalemia in these patients (taking special care of associations with other drugs, such as NSAIDs), as well as to advance in research and in the use of new drugs like the new MRAs, and LCZ696. These have proven a benefit when added to standard HF therapy, reducing the risk of hyperkalemia. More studies are needed with new drugs in development for hyperkalemia treatment, like sodium zirconium cyclosilicate and Patiromer. Bielecka-Dabrowa A, Rysz J, Mikhailidis DP, Banach M. What is the risk of hyperkalemia in heart failure? Expert Opin Pharmacother. 2011; 12(15):2329–2338. Shilpak MG. Pharmacotherapy for heart failure in patients with renal insufficiency. Ann Intern Med. 2003;138(11):917–924. Rodrigues EJ, Eisenberg MJ, Pilote L. Effects of early and late administration of angiotensin-converting enzyme inhibitors on mortality after myocardial infarction. Am J Med. 2003;115(6):473–479. Grigorian L, Varela A, Pedreira M, Gómez I, Virgós A, González-Juanatey JR. La insuficiencia renal es un predictor independiente de la mortalidad en pacientes hospitalizados por insuficiencia cardiaca y se asocia con un peor perfil de riesgo cardiovascular [Renal failure is an independent predictor of mortality in hospitalized heart failure patients and is associated with a worse cardiovascular risk profile]. Rev Esp Cardiol. 2006;59(2):99–108. Spanish. Desai AS. Hyperkalemia in patients with heart failure: incidence, prevalence, and management. Curr Heart Fail Rep. 2009;6(4):272–280. Torlén K, Kalantar-Zadeh K, Molnar M, Vashistha T, Mehrotra R. Serum potassium and cause-specific mortality in a large peritoneal dialysis cohort. Clin J Am Soc Nephrol. 2012;7(8):1272–1284. Korgaonkar S, Tilea A, Gillespie B, et al. Serum potassium and outcomes in CKD: insights from the RRI-CKD cohort study. Clin J Am Soc Nephrol. 2010;5(5):762–769. Xu Q, Xu L, Fan L, et al. Serum potassium levels and its variability in incident peritoneal dialysis patients: associations with mortality. PLoS One. 2014;9(1):e86750. Kovesdy CP. Management of hyperkalemia in chronic kidney disease. Nat Rev Nephrol. 2014;10(11):653–662. Palmer BF. Managing hyperkalemia caused by inhibitors of the renin-angiotensin-aldosterone system. N Engl J Med. 2004;351(6):585–592. Amir O, Hassan Y, Sarriff A, Awaisu A, Abd Aziz N, Ismail O. Incidence of risk factors for developing hyperkalemia when using ACE inhibitors in cardiovascular diseases. Pharm World Sci. 2009;31(3):387–393. Desai AS, Swedberg K, McMurray JJ, et al. Incidence and predictors of hyperkalemia in patients with heart failure: an analysis of the CHARM Program. J Am Coll Cardiol. 2007;1950(20):1959–1966. Phillips CO, Kashani A, Ko DK, Francis G, Krumholz HM. Adverse effects of combination angiotensin II receptor blockers plus angiotensin-converting enzyme inhibitors for left ventricular dysfunction: a quantitative review of data from randomized clinical trials. Arch Intern Med. 2007;167(18):1930–1936. Stanton BA. Regulation of sodium and potassium transport by mineralocorticoids. Semin Nephrol. 1987;7(1):82–90. Chakko SC, Frutchey J, Gheorghiade M. Life-threatening hyperkalemia in severe heart failure. Am Heart J. 1989;117(5):1083–1091. Chan TY, Critchley JA. Life-threatening hyperkalemia in an elderly patient receiving captopril, furosemide and potassium supplements. Drug Saf. 1992;7(2):159–161. Packer M, Lee WH. Provocation of hyper- and hypokalemic sudden death during treatment with and withdrawal of converting-enzyme inhibition in severe chronic congestive heart failure. Am J Cardiol. 1986;57(4):347–348. Paice B, Gray JM, McBride D, et al. Hyperkalemia in patients in hospital. BMJ. 1983;286(6372):1189–1192. Cody RJ, Ljungman S, Covit AB, et al. Regulation of glomerular filtration rate in chronic congestive heart failure patients. Kidney Int. 1988;34(3):361–367. Obialo CI, Ofili EO, Mirza T. Hyperkalemia in congestive heart failure patients aged 63 to 85 years with subclinical renal disease. Am J Cardiol. 2002;90(6):663–665. Lawson DH, O’Connor PC, Jick H. Drug attributed alterations in potassium handling in congestive cardiac failure. Eur J Clin Pharmacol. 1982;23(1):21–25. Reardon LC, Macpherson DS. Hyperkalemia in outpatients using angiotensin-converting enzyme inhibitors. How much should we worry? Arch Intern Med. 1998;158(1):26–32. Ramadan FH, Masoodi N, El-Solh AA. Clinical factors associated with hyperkalemia in patients with congestive heart failure. J Clin Pharm Ther. 2005;30(3):233–239. Yusuf S, Teo KK, Pogue J, et al. Telmisartan, ramipril, or both in patients at high risk for vascular events. N Engl J Med. 2008;358(15):1547–1559. Preston RA, Hirsh MJ, Oster MD, Oster HR. University of Miami Division of Clinical Pharmacology therapeutic rounds: drug induced hyperkalemia. Am J Ther. 1998;5(2):125–132. Lown B, Black H, Moore FD. Digitalis, electrolytes and the surgical patient. Am J Cardiol. 1960;6:309–337. Edes TE, Sunderrajan EJ. Heparin-induced hyperkalemia. Arch Intern Med. 1985;145(6):1070–1072. Kamel KS, Ethier JH, Quaggin S, et al. Studies to determine the basis for hyperkalemia in recipients of a renal transplant who are treated with cyclosporine. J Am Soc Nephrol. 1992;2(8):1279–1284. Muensterer OJ. Hyperkalaemic paralysis. Age Ageing. 2003;32(1):114–115. Finch CA, Sawyer CG, Flynn JM. Clinical syndrome of potassium intoxication. Am J Med. 1946;1:337–352. Evers S, Engelien A, Karsch V, Hund M. Secondary hyperkalaemic paralysis. J Neurol Neurosurg Psychiatry. 1998;64(2):249–252. Freeman SJ, Fale AD. Muscular paralysis and ventilatory failure caused by hyperkalemia. Br J Anaesth. 1993;70(2):226–227. Parham WA, Mehdirad AA, Biermann KM, Fredman CS. Hyperkalemia revisited. Tex Heart Inst J. 2006;33(1):40–47. Surawicz B, Chlebus H, Mazzoleni A. Hemodynamic and electrocardiographic effects of hyperpotassemia. Differences in response to slow and rapid increases in concentration of plasma K. Am Heart J. 1967;73(5):647–664. Montague BT, Ouellette JR, Buller GK. Retrospective review of the frequency of ECG changes in hyperkalemia. Clin J Am Soc Nephrol. 2008;3(2):324–330. Acker CG, Johnson JP, Palevsky PM, Greenberg A. Hyperkalemia in hospitalized patients: causes, adequacy of treatment, and results of an attempt to improve physician compliance with published therapy guidelines. Arch Intern Med. 1998;158(8):917–924. Szerlip HM, Weiss J, Singer I. Profound hyperkalemia without electrocardiographic manifestations. Am J Kidney Dis. 1986;7(6):461–465. Aslam S, Friedman EA, Ifudu O. Electrocardiography is unreliable in detecting potentially lethal hyperkalemia in haemodialysis patients. Nephrol Dial Transplant. 2002;17(9):1639–1642. Bashour T, Hsu I, Gorfinkel HJ, Wickramesekaran R, Rios JC. Atrioventricular and intraventricular conduction in hyperkalemia. Am J Cardiol. 1975;35(2):199–203. Mattu A, Brady WJ, Robinson DA. Electrocardiographic manifestations of hyperkalemia. Am J Emerg Med. 2000;18(6):721–729. Littmann L, Monroe MH, Taylor L 3rd, Brearley WD Jr. The hyperkalemic Brugada sign. J Electrocardiol. 2007;40(1):53–59. Weir R, Rolfe M. Potassium homeostasis and renin-angiotensin- aldosterone system inhibitors. Clin J Am Soc Nephrol. 2010;5(3):531–548. Makani H, Bangalore S, Desouza K, Shah A, Messerli FH. Efficacy and safety of dual blockade of the renin-angiotensin system: meta-analysis of randomised trials. BMJ. 2013;346:f360. Albert NM, Yancy CW, Liang L, et al. Use of aldosterone antagonists in heart failure. JAMA. 2009;302(15):1658–1665. Rassi AN, Cavender MA, Fonarow GC, et al. Temporal trends and predictors in the use of aldosterone antagonists post-acute myocardial infarction. J Am Coll Cardiol. 2013;61(1):35–40. Pitt B, Zannad F, Remme WJ, et al. The effect of spironolactone on morbidity and mortality in patients with severe heart failure. Randomized aldactone evaluation study investigators. N Engl J Med. 1999;341(10):709–717. Pitt B, Remme W, Zannad F, et al. Eplerenone, a selective aldosterone blocker, in patients with left ventricular dysfunction after myocardial infarction. N Engl J Med. 2003;348(14):1309–1321. Zannad F, McMurray JJ, Krum H, et al. Eplerenone in patients with systolic heart failure and mild symptoms. N Engl J Med. 2011;364(1):11–21. Pitt B. Heart failure: the role for mineralocorticoid receptor antagonists. Swiss Med Wkly. 2014;144:w13959. Juurlink DN, Mamdani MM, Lee DS, et al. Rates of hyperkalemia after publication of the Randomized Aldactone Evaluation Study. N Engl J Med. 2004;351(6):543–551. Zannad F, Gattis W, Rossignol P, et al. Mineralocorticoid receptor antagonists for heart failure with reduced ejection fraction: integrating evidence into clinical practice. Eur Heart J. 2012;33(22):2782–2795. Khanna A, White W. The management of hyperkalemia in patients with cardiovascular disease. Am J Med. 2009;122(3):215–221. Alper AB, Campbell RC, Anker SD, et al. A propensity-matched study of low serum potassium and mortality in older adults with chronic heart failure. Int J Cardiol. 2009;137(1):1–8. Bowling CB, Pitt B, Ahmed MI, et al. Hypokalemia and outcomes in patients with chronic heart failure and chronic kidney disease: findings from propensity-matched studies. Circ Heart Fail. 2010;3(2):253–260. Castellino P, Bia MJ, DeFronzo RA. Adrenergic modulation of potassium metabolism in uremia. Kidney Int. 1990;37(2):793–798. Reza MJ, Kovick RB, Shine KI, Pearce ML. Massive intravenous digoxin overdosage. N Engl J Med. 1974;291(15):777–778. Adrogue HJ, Madias NE. Changes in plasma potassium concentration during acute acid-base disturbances. Am J Med. 1981;71(3):456–467. Sica D, Hess M. Aldosterone receptor antagonism: interface with hyperkalemia in heart failure. Congest Heart Fail. 2004;10(5):259–264. Green D, Green HD, New DI, Kalra PA. The clinical significance of hyperkalaemia-associated repolarization abnormalities in end-stage renal disease. Nephrol Dial Transplant. 2013;28(1):99–105. Winkler AW, Hoff HE, Smith PK. 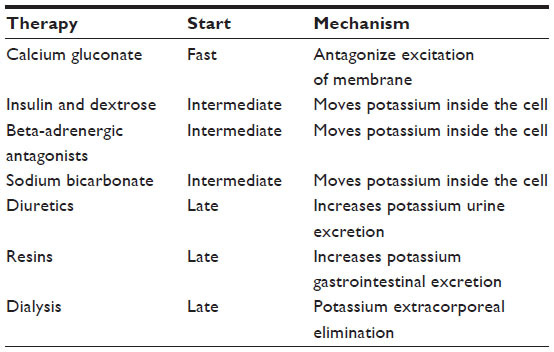 Factors affecting the toxicity of potassium. Am J Physiol. 1939;127:430–435. Allon M, Copkney C. Albuterol and insulin for treatment of hyperkalemia in hemodialysis patients. Kidney Int. 1990;38(5):869–872. Salem MM, Rosa RM, Batlle DC. Extrarenal potassium tolerance in chronic renal failure. Am J Kidney Dis. 1991;18(4):421–440. Pancu D, LaFlamme M, Evans E, Reed J. Levalbuterol is as effective as racemic albuterol in lowering serum potassium. J Emerg Med. 2003; 25(1):13–16. Kamel SK, Wei C. Controversial issues in the treatment of hyperkalemia. Nephrol Dial Transplant. 2003;18(11):2215–2218. Vasavada N, Saha C, Agarwal R. A double-blind randomized cross-over trial of two loop diuretics in chronic kidney disease. Kidney Int. 2003;64(2):632–640. Zehnder C, Gutzwiller JP, Huber A, Schindler C, Schneditz D. Low potassium and glucose free dialysis maintains urea but enhances potassium removal. Nephrol Dial Transplant. 2001;16(1):78–84. Gruy-Kapral C, Emmett M, Santa Ana CA, Porter JL, Fordtran JS, Fine KD. Effect of single dose resin-cathartic therapy on serum potassium concentration in patients with end-stage renal failure. J Am Soc Nephrol. 1998;9(10):1924–1930. Pitt B, Kober L, Ponikowski P, et al. Safety and tolerability of the novel non-steroidal mineralocorticoid receptor antagonist Bay 94-8862 in patients with chronic heart failure and mild or moderate chronic kidney disease: a randomized, double-blind trial. Eur Heart J. 2013;34(31):2453–2463. Pitt B, Anker SD, Böhm M, et al. Rationale and design of MinerAlocorticoid Receptor antagonist Tolerability Study-Heart Failure (ARTS-HF): a randomized study of finerenone vs eplerenone in patients who have worsening chronic heart failure with diabetes and/or chronic kidney disease. Eur J Heart Fail. 2015;17(2):224–232. Bramlage P, Swift S, Thoenes M, Minguet J, Ferrero C, Schmieder RE. Non-steroidal mineralocorticoid receptor antagonism for the treatment of cardiovascular and renal disease. Eur J Heart Fail. 2015. [Epub ahead of print]. McMurray J, Packer M, Desai A, et al. Angiotensin–neprilysin inhibition versus enalapril in heart failure. N Engl J Med. 2014;371(11):993–1004. Pitt B, Anker SD, Bushinsky DA, Kitzman DW, Zannad F, Huang IZ. Evaluation of the efficacy and safety of rly5016, a polymeric potassium binder, in a double-blind, placebo-controlled study in patients with chronic heart failure (the PEARL-HF) trial. Eur Heart J. 2011;32(7):820–828. Pitt B, Anker SD, Böhm M, et al. Patiromer in patients with kidney disease and hyperkalemia receiving RAAS inhibitors. N Engl J Med. 2015;372(3):211–221. Bakris G, Pitt B, Weir M, et al. Effect of patiromer on serum potassium level in patients with hyperkalemia and diabetic kidney disease. JAMA. 2015;314(2):151–161. Packham DK, Rasmussen HS, Lavin PT, et al. Sodium zirconium cyclosilicate in hyperkalemia. N Engl J Med. 2015;372(3):222–231. Wise J. Two drugs show promising results for treating hyperkalemia in US study. BMJ. 2015;17(350):h278.